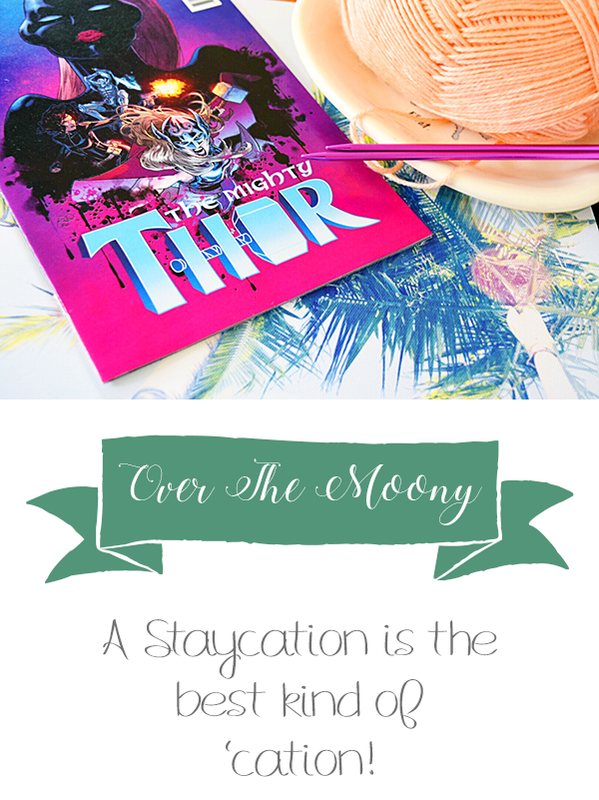 Over The Moony: A Stay-Cation Is The Best Kind Of 'Cation! A Stay-Cation Is The Best Kind Of 'Cation! Who has two thumbs and is on vacation from work?! This girl. The wonderful thing about the summer, beside the obvious, is that my work allows us to work 4 longer-than-usual days and have every Friday off from just after Memorial Day through Labor Day. While the long weekends are absolutely fantastic, sometimes you just need a little more time off. And that's what I have! Hello sleeping in, getting back to my workout regime and getting things done! Goodbye boring work things! And the best part of it all? I'm not going anywhere. Okay, well, maybe a day trip or two, but I'm not really going anywhere, you know what I mean? While I love vacations (and can't wait to go back to Florida), I am a giant fan of staying at home and just getting things done, or doing things in my area. Plus, there are endless benefits of staycations, with the most important of them all being that they're free! There is nothing better than free things, right? Odds are, you have tons of things you've been wanting to do around the house that are fun. There are projects that you've been wanting to get done, hobbies you've been wanting to try, TV shows you've been wanting to binge on. There are endless things to do in your own home or hometown that can keep you busy. And if there aren't, you can always take little trips that aren't a crazy hike to get to. I'm incredibly fortunate that I live really close to a lot of awesome places. I can see the skyline of Philadelphia a block from my house and get to the city in 10 minutes; I can grab a train and be in New York City in a 90 minute train ride (even less if I grab an express); I'm only a minimum of 40 minutes away from the Atlantic Ocean, but there are many places to go along the coast that are further; I'm 90 minutes away from Baltimore; 2 hours away from Washington DC; and the list goes on and on. For all the crap everyone gives New Jersey, it really is pretty awesome. There are so many cool things to do within the state that no one even knows about. The more I dig around, the more surprised I am. So, you may be wondering, what you do you plan on doing on your staycation (besides all the boring stuff like cleaning, taking cats to be groomed and possibly getting a haircut)? Well, I'd absolutely love to tell you! The Franklin Institute is a really neat museum in Philadelphia. There are all sorts of cool science exhibits and a ton of traveling exhibits that have extended stays there. The latest one is The Science of Pixar where you get to learn about how Pixar movies are made and take pictures with life-size statues of all sorts of characters. It's going to be so fun! I am SUPER EXCITED about this. I may have mentioned a couple posts ago that I got myself my first DSLR camera, and while I have a pretty basic knowledge of what certain settings do, I'm scared to veer off the Auto path into the Manuel world. This class has is all about getting over that fear and then some. I'm excited to learn how to use my new camera and its various features and put those all to use! The best part is that it is a self-paced class, so I can just go through the lessons when I'm ready and go along as fast or slow as I want. Odds are I'm going to go pretty fast. I already started it this morning and I'm on lesson six. They give you "homework" to work on before moving onto the next lesson, and this homework is a little hefty. I'm excited to go out later this afternoon to give it a try! In my mind, those two baby blankets that I was talking about in my Knitting Obsession post will be done by the end of my Staycation. Will they actually? Who knows. They're much smaller than the one that I'm currently working on, which was a cast-on of 148 and has purling, which in my mind takes longer than knitting. So we shall see. Even if I can get one done and another going I feel like I can burn through them. And then it's onto working on my Christmas knitting projects! Cape May is the furthest southern point of New Jersey and is consistently ranked as one of the best beaches in America. It has an old-timey feel with tons of beautiful Victorian houses and a stunning lighthouse. I haven't been there since high school so I'm excited to go back. I'm hoping to be well into my DSLR class by that point so I can put some of my new knowledge to good use! Plus going during the week should mean that it will be far less crowded and I shouldn't have any issues with going up into the lighthouse or getting some delicious ice cream in a timely fashion. I'm hoping to stick it out until sunset because I'm sure it will be absolutely beautiful. Not having spent my entire childhood in New Jersey I don't feel the same affinity for going "down the shore" as most of the rest of the people I know, but I definitely enjoy going down there a couple times over the summer. Not everyone gets to enjoy the ocean! I moved in with John in February of this year and we haven't done anything to the house we're in. He's lived here for a couple of years and is leaving me in charge of the design of the place. No pressure, right? So until we're able to do what he wants to do to our counter tops, I figured I could throw some contact paper down to make them look nicer. Right now we're stuck with a magenta counter, which has just been making my skin crawl as of late. There are so many contact paper options on Amazon that I figured I could order some and get the counter covered in a couple hours. Fingers crossed. I'm sure this easy project will turn into a nightmare but I can give it a shot! I am so woefully behind on so many comics. It's really sad. But I will remedy that this week! The only ones I'm up-to-date on are Thor, Black Widow and Black Panther. I have to catch up on X-Men '92, the other X-Men one I read, Vote Loki, Rocket and Groot, Poison Ivy, SpiderGwen, and roughly a million more. It's going to be a lot of reading. But maybe if I try to tackle one series a day it won't be so daunting. I have never seen these movies, not because I'm not interested. The bits I catch on TV always interest me but I have a hard time finding three hours to sit and watch a movie. Last month I watched all of The Hobbit movies, which I really enjoyed (and became super obsessed with Thranduil - he's like the Lucius Malfoy of Elven people) so I'm excited to dive into the LOTR movies. I figure I can throw them on while I'm knitting and kill two birds with one stone! And I'm going to get some stuff done on here. What am I going to get done? I don't know. But I know I still have a lot to learn about blogging and social media and all that jazz and I have a sizeable Pinterest board with all sorts of tips. I could probably make a day of reading through all the various articles and putting some of that stuff into action. We're also going to catch Suicide Squad tonight and I'm exited to catch up with John's sister, Michele, as she is coming up to Delaware from Virginia for work on Tuesday and we're going to meet up with her for dinner! All-in-all, it's looking like a great staycation! Are you going on vacation this summer or enjoying a staycation like me? Which do you prefer? Let me know in the comments below!